brooksstreet | NEWS: What's New in Napa? 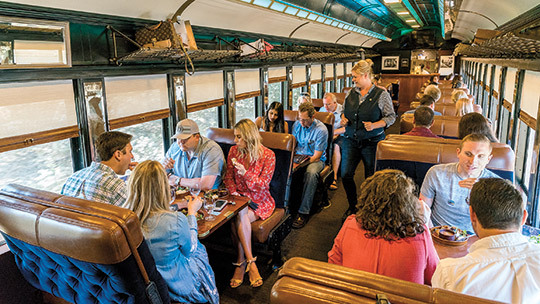 Beautifully refurbished vintage cars, a huge upgrade to the food and plenty of tour options have made the train an appealing way to exlore Napa Valley, without having to worry about driving. There are now dozens of packages—winery visits, including trips to St. Supéry, Beringer, Hall and Inglenook (a private shuttle service gets wine lovers to and from wineries not directly on the train route), winemaker dinners, sunset tours, live music concerts and murder mystery experiences. The Famiglia Tour is a 6-hour adventure that includes a four-course meal and stops at Silverado Vineyards, Whitehall Lane and Grgich Hills for $332 per person; the Castle Winery Tour pairs a visit to the popular Castello di Amorosa with a gourmet, California cuisine lunch and one-and-a-half-hour train ride for $269.